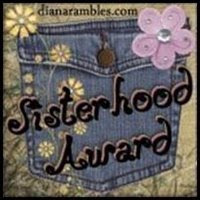 Thanks Lynette/http://theysayimnuts.blogspot.com/for this Sisterhood Award you are very sweet to give me this award. My friend Denise over at http://koffordsincolorado.blogspot.com/ is having an awesome giveaway. Go check it out and I bet you will fall in love with her blog too. Thanks Lou Ann, you are just too kind and I appreciate you!!! I will be sure and check out the site above too. Thanks for the tip! Thank you for the mention. You deserve an award for surviving a broken heart right now. Just know we are doing our best to hug you. Our arms are just to short to reach! Thanks for sharing I love to check out new blogs. Oh I'm so sorry about your dog. That is so hard to deal with, I remember when we had to put our dog to sleep at the old age of 15. It was really hard to adjust without her there. I sent your package yesterday, you should be getting it soon. I read your comment on We Are THAT Family. You said something like other blogs are funnier or wittier - awww heck - don't compare yourself to other blogs. The people who know you can read you in your blog. Those of us who don't know you, or just met you, will be able to get to know the real you by the way you speak in your posts. If you started sounding like Pioneer Woman you would no longer be you! I'm an encourager, a crier, sentimental and totally into the law of attraction. It will never get out of me and my blog reflects it. Be you! and keep blogging!